Buy through MusicWeb £14.00/14.75/15.25 postage paid. Although he spent many years in Nancy, Ropartz was a Breton at heart. Brittany is often evoked in his music in one way or another. So, when World War I broke out, he found refuge in Brittany, where he composed his large-scale and quite substantial Piano Trio in A minor. The opening of the first movement evokes a beautiful seascape in all but the name, although – needless to say – the music is neither descriptive nor programmatic. The music nevertheless reflects on the hardships of the war years, and is rather troubled, anguished and often dramatic. Structurally, the Piano Trio is still strongly indebted to Franck, as were many of Ropartz’s early works. He, however, managed to lighten his at times dense textures by his recourse to some Breton folk music, either real or subtly alluded to. In this, Ropartz often came close to Joseph Jongen, whose music often has some rustic flavour. Neither was Ropartz totally indifferent to Impressionism, that also left its mark on the music. The first movement is fairly intricately worked-out. By contrast, the Scherzo is an energetic outdoor dance with a calmer, slower central Trio. The third movement is a beautifully expansive song without words leading straight into the fairly developed Finale opening with tolling bells on the piano launching another vigorous, folk-inflected main theme, actually related to the first main theme of the first movement. Ropartz’s Piano Trio, in much the same way as the First Violin Sonata dedicated to Ysaÿe, is a good example of the composer’s own personal approach to Franck’s cyclic construction. As a number of other composers active during the inter-war years, Ropartz composed a work for the Quintette instrumental de Paris (flute, harp and string trio) founded by Pierre Jamet. Koechlin (Primavera Op.156 – 1934), Jean Cras (Quintette – 1928), Pierné (Variations libres et Final Op.51 – 1932), Roussel (Sérénade Op.30 – 1925) as well as Joseph Jongen (Concert à cinq Op.71 – 1923) and Daniel-Lesur (Suite Médiévale – 1945/6), whom Michel Fleury fails to mention in his otherwise informative and well-documented insert notes, are among the ones who composed for Jamet. 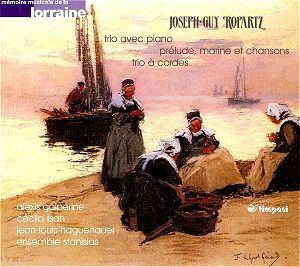 Ropartz’s offering was his delightful Prélude, marine et chansons completed in 1928, and likely one of his most readily appealing works. The music is as beautifully crafted as ever, but displays the lighter, more playful side of Ropartz’s music. The music unpretentiously speaks for itself and the concluding Chansons again have a refreshing rustic flavour. As well as similar works by Schmitt, Pierné and Roussel, Ropart’s String Trio in A minor was prompted by the celebrated Trio Pasquier. It is a somewhat less expansive work than the Piano Trio, although it, too, is a substantial work in four movements of roughly equal length. The Scherzo is just a tat shorter than the other three movements. However, when compared to the Piano Trio (also in A minor, but with quite different results), the String Trio is much more compact, rather more ascetic; and a work in which the composer kept his material strictly under control, while paring it down to the essential. I for one regard it as one of Ropartz’s finer achievements, and undoubtedly a major work that clearly deserves wider exposure and that generously repays repeated hearings. The present recording of the Piano Trio and of Prélude, marine et chansons was made as far back as 1995, and is apparently only released now as part of the generous and brave enterprise on Timpani’s part to record a large selection of Ropartz’s output. The Quatuor Stanislas is now completing their recording of Ropartz’s string quartets, while Timpani is completing their recording of the symphonies. These performances are strongly committed and beautifully played throughout, whereas the recording is up to Timpani’s best and the production excellent with informative notes by Michel Fleury. This most welcome addition to Ropartz’s expanding discography is yet another feather in the caps of Timpani and the Stanislas. Not to be missed.